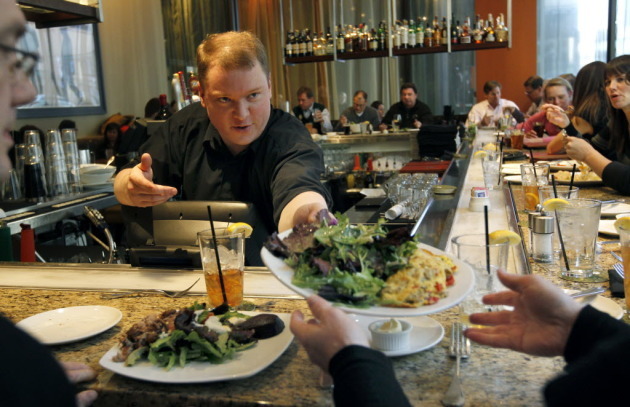 Your restaurant check in downtown Minneapolis comes with a higher tax than in any other major city in the country, according to a report released on Tuesday. The combined tax on meals downtown -- including state/city sales taxes and a downtown restaurant tax -- is 10.775 percent. That makes it No. 1 among the nation's 50 largest cities, according to the Tax Foundation, a D.C.-based think tank. Minneapolis barely edged out Chicago, which came in second with a 10.75 percent combined tax. Virginia Beach, Va. was third at 10.5 percent. The study could become ammunition in the Vikings stadium debate. The city taxes -- which were authorized by the state -- currently prop up the convention center, but local and state lawmakers are debating what to do with them when the facility's debt is paid off in 2020. Rep. Greg Davids would like to eliminate the city taxes altogether. Minneapolis Mayor R.T. Rybak has proposed extending them to pay for a Vikings stadium, convention center operations and Target Center improvements. Schiff said that instead of prolonging the taxes, the city should explore ways to lower the rates when convention center debt is paid off. At a recent hearing at the Capitol, Republican lawmakers set their sites on Minneapolis' taxes. “You know who pays for this? The citizens in my district, my constituents that decide to go to Minneapolis – maybe go out to a restaurant for the night,” Rep. Sarah Anderson, R-Plymouth, said earlier this month. “They don’t get to see the benefit on a day-to-day” basis. Here is a breakdown of the meal taxes in downtown, according to the Department of Revenue. Want some live entertainment while you're eating dinner? That will add another 3 percent, bringing the total tax to 13.775 percent in downtown.